We ventured out to the remotest parts of Spitsbergen, the island of Kvitøya in the northeast of the Svalbard archipelago, not far from Russian Franz Josef Land. 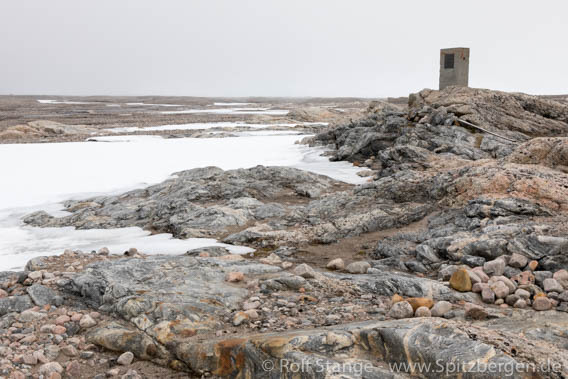 This is where Salomon August Andrée, Knut Frænkel and Nils Strindberg reached land for the first time again after a balloon flight of 3 days and more than 2 months of marching across the drifting ice. They started to get ready for the winter, but died all after a short time for reasons which we will never really find out for sure. It needs a lot of luck to get to this place. Even today, Kvitøya is often surrounded by ice, and when this is not the case, then the surf is often going high on the exposed coast. And when this is not the case, then there are often some polar bears hanging around. The way from the shore to the place where Andrée, Frænkel and Strindberg had their final camp is short, but not easy to walk. Today, we are lucky! It is a bit foggy, which fits the atmosphere of this desolate place perfectly well.